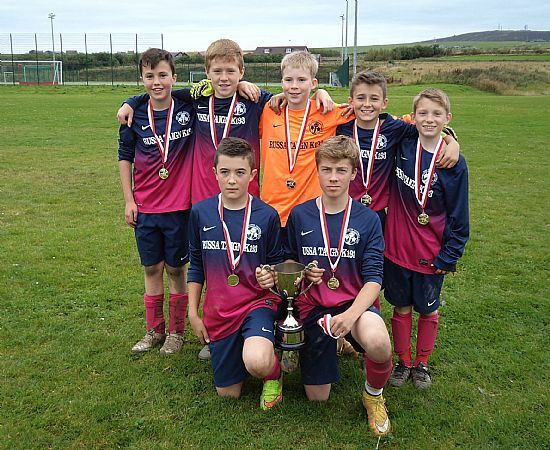 The final competition of the outdoor summer football season took place at the Picky Outfield on Saturday 26 September with eleven S1 & Under teams competing for the Clouston Cup and Plate. Although overhead conditions were perfect it was a different story underfoot with the matches being played on a surface that was the worse for wear after the wet summer and began to resemble a ploughed field as the tournament progressed. Pick of the closely fought semi-finals was the Cup match between the two Thorfinn teams with a goal seconds before the end of extra time providing a narrow victory for Thorfinn A. The Cup final was equally exciting with Thorfinn A and East Utd A creating plenty of goal scoring opportunities in an end to end match. United held a narrow 1-0 lead at half time after Jamie Clouston scored from close range after Thorfinn failed to clear their lines. Thorfinn started the second half the better team and equalised when the ball came back off the bar and Ryan Tait nodded the ball into the net with a simple header. The winning goal from East United was worthy of winning the final with Alexander Scott hammering a drive low into the Thorfinn net from a tight angle to edge out Thorfinn in a match which could have gone either way. There were fewer chances in the Plate final with defences on top as Stromness B took on East Utd B. One of the few chances in the match saw a good passing move involving a number of Stromness players midway through the second half end with Owen Buchannan scoring the only goal of the game. This was a good team goal which was again worthy of winning the final match. Stromness A 0 Thorfinn A 2; Dounby B 0 East Utd B 1; East Utd D 0 Thorfinn C 2; Thorfinn A 1 East Utd B 0; Dounby B 2 East Utd D 0; Thorfinn C 0 Stromness A 5; East Utd B 5 East Utd D 0; Dounby B 0 Stromness A 4; Thorfinn A 2 Thorfinn C 0; Stromness A 2 East Utd B 1; Thorfinn C 1 Dounby B 1; East Utd D 2 Thorfinn A 7; East Utd B 1 Thorfinn C 0; Stromness A 6 East Utd D 0; Thorfinn A 2 Dounby B 0. East Utd C 0 East Utd A 4; Stromness B 1 Dounby A 0; Thorfinn B 1 East Utd C 0; Stromness B 0 East Utd A 3; Dounby A 0 Thorfinn B 1; East Utd C 0 Stromness B 2; East Utd A 3 Dounby A 0; Stromness B 0 Thorfinn B 3; East Utd C 2 Dounby A 4; Thorfinn B 0 East Utd A 0. Clouston Cup Semi-Finals: Thorfinn A 2 Thorfinn B 1 (a.e.t); East Utd A 5 Stromness A 2; Final: Thorfinn A 1 East Utd A 2. 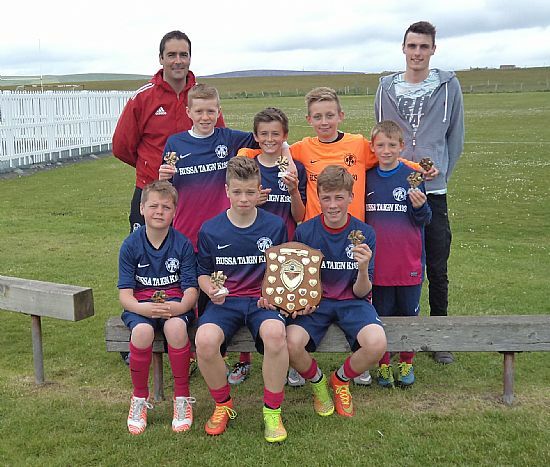 Clouston Plate Semi-Finals: East Utd B 3 East Utd C 2; Stromness B 1 Dounby B 0; Final: East Utd B 0 Stromness B 1. The S1 & Under Leagues were concluded in Dounby on Saturday in fair conditions. Due to weather cancellations the planned four weeks of fixtures were reduced to two in order to get the competition completed before the school summer holidays. The A League was very competitive with the winner being decided in a winner takes all match between Thorfinn A and East Utd A. In a fiercely contested match that threatened to boil over on a couple of occasions a single goal secured a deserved victory for East who created the bulk of the chances. Thorfinn B had a more comfortable run in the B League maintaining a perfect 100% record in winning all seven of their matches to retain the league for the third year in a row. At the end of the competition OYDG Chairman Stephen Crawford congratulated all the participating teams and especially the winning teams. He thanked the clubs for refereeing and the Kemp families for their continued sponsorships of the leagues. Greg Kemp then presented the EG Kemp Shield and winners trophies to East Utd A and Paul Kemp presented the BW Kemp Cup and winners trophies to Thorfinn B.
Stromness A 2 Thorfinn A 4; East Utd A 8 Dounby A 0; East Utd A 4 Stromness A 2; Thorfinn A 7 Dounby A 0; Dounby A 0 Stromness A 3; Thorfinn A 0 East Utd A 1. Dounby B 0 Thorfinn C 3; Dounby C 1 East Utd C 7; East Utd B 12 East Utd D 0; Thorfinn B 7 Stromness B 0; Thorfinn C 9 Dounby C 0; Dounby B 0 East Utd C 2; Thorfinn B 4 East Utd B 0; Dounby B 4 Stromness B 1; East Utd D 0 East Utd C 11; East Utd B 11 Dounby C 0; Thorfinn B 3 Thorfinn C 0; East Utd D 1 Stromness B 6; Dounby C 1 Stromness B 3; Dounby B 1 East Utd B 4. A glorious sunny day made for perfect conditions as the S1 & Under leagues kicked off in Stromness. Four A teams are competing for the E G Kemp Shield and eight B, C and D teams are playing for the B W Kemp Cup, with the competitions being run over 4 weeks at different venues. Division 1 looks like it will be tightly fought with East United A and Thorfinn A emerging as the early leaders. 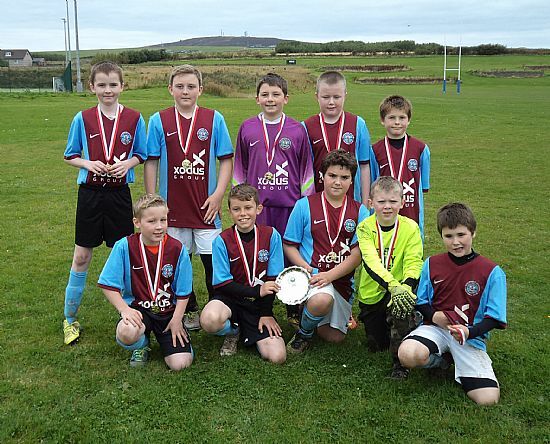 Both teams won their opening matches against Stromness and Dounby before facing up in the final match. Thorfinn had to rely on an excellent display by their keeper in a game in which East created the bulk of the chances. Despite stout Thorfinn defence East pressure finally paid off when they took the lead early in the second half. Against the run of play Thorfinn scored an equaliser when a spectacular lob from distance looped over the East keeper to level the match at 1-1. With the teams to play each other on another three occasions there is plenty left to play for. Thorfinn B dominated the opening round of matches in Division 2 winning all four of their opening matches and scoring a barrowload of goals in the process to lead Division 2 ahead of their Thorfinn C teammates. Stromness A 0 East Utd A 3, Dounby A 0 Thorfinn A 4; Thorfinn A 1 Stromness A 0, East Utd A 4 Dounby A 0; Thorfinn A 1 East Utd A 1, Dounby A 1 Stromness A 3. East Utd B 3 Stromness B 0, Thorfinn C 1 East Utd C 0; Thorfinn B 14 East Utd D 0, Dounby B 1 Dounby C 0; East Utd C 0 East Utd B 0, Stromness B 0 Thorfinn C 3; Dounby C 0 Thorfinn B 10, Dounby B 8 East Utd D 0; Stromness B 1 East Utd C 3, East Utd B 3 Thorfinn C 0; Thorfinn B 3 Dounby B 0, East Utd D 0 Dounby C 1; Thorfinn B 12 East Utd C 0, East Utd D 0 Thorfinn C 4. 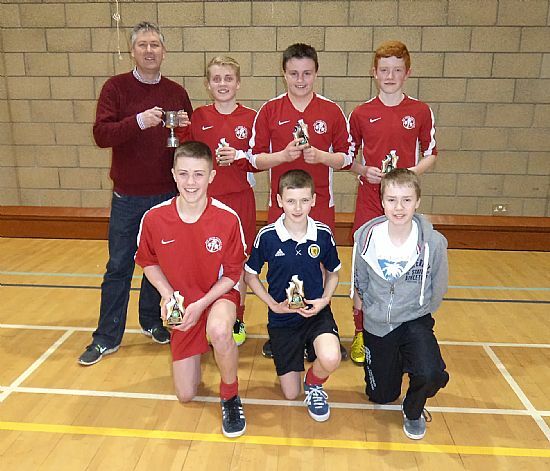 The W Hourston Indoor 4’s for S2 & Under players took place at Picky last Friday evening (6th March) with 8 teams competing. 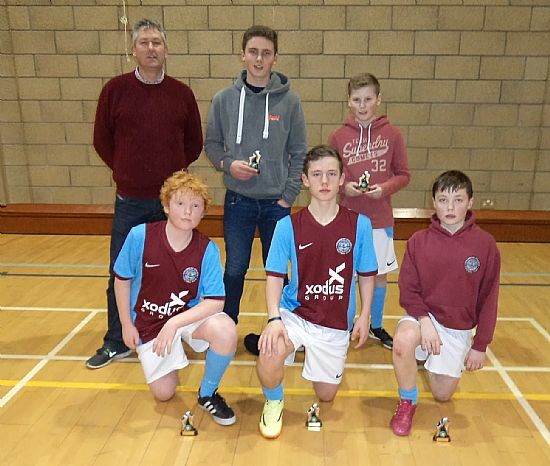 This was a very entertaining competition which ended in a highly exciting final between Stromness A and East Utd A. Having beaten East in the group matches Stromness started as favourites and they confirmed this tag by taking the lead in the match. However East produced an excellent comeback storming into a 3-1 lead. Despite Stromness scoring a second goal it was too little and too late and United held on for a deserved victory. At the end of the competition OYDG Chairman Stephen Crawford complemented all the teams on the excellent standard of football played on the night before congratulating the two finalists. He then handed over to Tom Macphail who presented the Cup and Winners medals to East United and the Runners Up medals to Stromness. OYDG would like to thank W Hourston Jewellers for their continued sponsorship of the Indoor 4’s and thanks are also due to the clubs for providing referees for the competition. Stromness A 4 Thorfinn B 0; Thorfinn C 0 East Utd A 4; Thorfinn B 2 Thorfinn C 2; East Utd A 1 Stromness A 3; Thorfinn C 1 Stromness A 7; East Utd A 7 Thorfinn B 0. 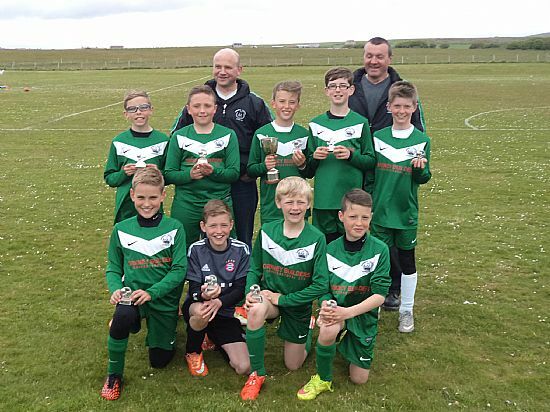 Stromness B 0 Thorfinn A 1; East Utd B 2 East Utd C 0; Thorfinn A 5 East Utd B 2; East Utd C 3 Stromness B 1; East Utd B 2 Stromness B 1; East Utd C 0 Thorfinn A 3.